Starring a remarkable line-up, this album is a collaborative work from Nurse With Wound's Steven Stapleton, M.S. Waldron (of irr. apt. (ext.)) Stilluppsteypa's Sigtryggur Berg Sigmarsson, fellow Helen Scarsdale artist Jim Haynes and the more enigmatic R.K. Faulhaber, who is cited as a peripheral contributor to irr. apt. (ext.). Expect psychotropic surrealism, droning sonic mesmerism and absorbing collage abstractions. 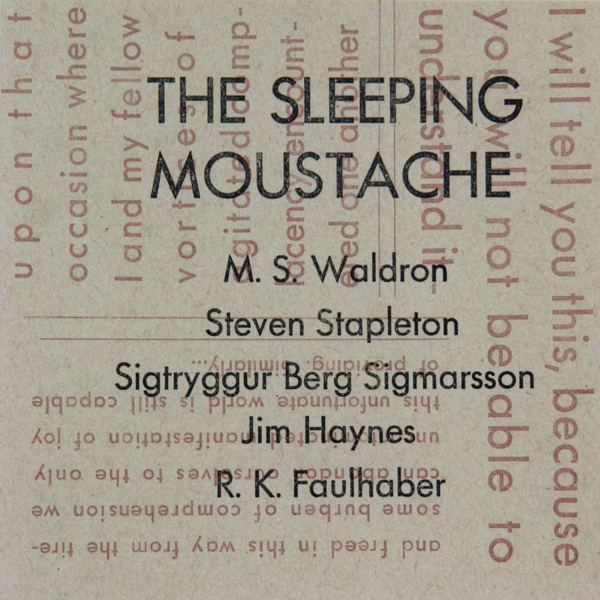 "An epiphany of controlled disorder, a convulsion of beauty, a cascade of thought from delirious minds, The Sleeping Moustache is an exquisite manifestation of sound poetry scattered into a tortuous collage mired in an oblique melancholy. Magnetic tones extracted from the ether, mechanical sounds smeared into a lugubrious growls, horns trumpeting straight out of John's Book of Revelation, ululations sliced into information overload that Schwitters himself would be proud of. The Sleeping Moustache presents a psychically instable landscape, where dreams and nightmares wreak havoc upon the drudgery of daily life. The closest audible territory for The Sleeping Moustache might be the psychoactive constructions of Nurse With Wound's Homotopy To Marie, although the characters in this drama happened upon an entirely different map of that terrain."